A year ago right now I was in the hospital, coming to terms with the likelihood that my transplanted pancreas wasn’t working. As if that wasn’t bad enough, I was over 1,000 miles from home. I’ve been hospitalized numerous times over the years, but this time I was faced with the prospect of a long flight home from L.A. with a much different health status than when I left. It was the most extreme emotional letdown of my life because I was two days in to a conference for professional speakers. Ideas were coming at me from all directions and I knew I’d need to hit the ground running when I got home. It was one of those rare moments when I felt completely in my element. I was exactly where I was supposed to be, doing exactly what I was intended to do. At a mid-afternoon break, I bought a Dr. Pepper from a vending machine to give me a caffeine boost. Later that evening I started feeling nauseated. The roller-coaster was about to take a sharp drop. I wrote about it last year on my other blog. That week taught me some valuable life lessons thanks to the generosity of others and reflection on my own life. It was good for me to go back and re-read these posts from last year. I hope you get something valuable from following my progress through that strange but life-altering week in my life. Alright, it’s time for my first confession. Last night, just before bed, I tore into the emergency chocolate. I keep it in a kitchen drawer for those times when my blood sugar takes a dive. Yes, there are other methods that are faster and more effective, but why can’t I get just a little enjoyment out of an otherwise unpleasant experience. So I feed chocolate to that noodle, gave myself a shot of fast-acting insulin, and went to bed. When I woke up this morning my glucose was 235. I’d like to tell you there won’t be a next time, but there will be. It won’t be any time soon, though. And it might be mini Snickers bars or peanut butter cups. One thing I always liked about Highlands Oncology is the small coffee bar near the entrance. Like most places selling coffee, they also offer pastries, cookies, and the like. Lucky for me, my pancreas was working fine two years ago when I was having chemotherapy. If they nausea wasn’t too severe, I could order something sweet. I’m happy to report that two years out, today’s appointment showed good lab numbers, though I’m slightly anemic. On my way out I stopped at the receptionist desk to make my next appointment. The tempting aroma of fresh cinnamon rolls floated past my nose and went straight to my belly. 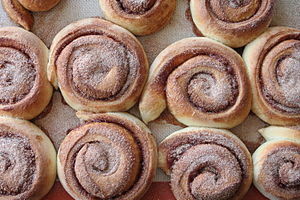 Cinnamon rolls are on my short list of foods I crave as soon as I smell. After the kidney/pancreas transplant in 1998, I went to a mall to shop for new, slightly larger clothes. The prednisone added bulk and my old clothes didn’t fit. After I bought new clothes, I stopped at a place selling big, gooey cinnamon rolls with nuts sprinkled on top. I was in heaven—sticky, messy, lip-smacking heaven. A few years after the transplant I started being more mindful of my weight. I wasn’t overweight, but knew I needed to curb my cinnamon roll cravings. Now I wish I’d had them more often. I was a good boy today and resisted the urge. That sweet perfume of cinamon baked into a pastry wasn’t enough to seduce me…this time. Maybe I’ll wear a clothes pin on my nose at my next oncology appointment. You’ve been in there 15 years today. What an amazing time it has been. You worked hard, keeping my glucose normal until a year ago. That’s longer than the average transplanted pancreas lasts. During that time I never had a single problem with you. You went to work as soon as you were stitched in place. By the end of the day, a nurse in ICU would tell me those four words I never thought I’d hear, “You’re not diabetic anymore.” I drifted off to sleep feeling more free than I’d felt in 21 years, in spite of all the tubes and wires that tethered me to all sorts of medical equipment. You worked beautifully every day, right up until you stopped making insulin altogether. I gave you quite a workout in those first few months, eating sweets to my heart’s content, just because I could. You held up in spite of all the harsh chemicals in my bloodstream keeping my immune system from attacking you. You held up after the kidney failed and I had to get another. You held up when I had cancer and my body was flooded with toxic chemotherapy. You gave me 14 years of a life I bid farewell to when I was only twelve. At that ender age I had to accept that I would be diabetic for the rest of my life along with the insulin shots, a strict diet, and a long list of possible (and scary) health problems that went with it. After several years with the disease, some of those scary health issues began. It looked like my life was on a long downhill slide. After doing peritoneal dialysis for 9 months and waiting for a kidney, I discovered a pancreas could be transplanted. Just like that, I had to rewrite reality. The impossible was possible after all. I wasn’t the only one praying for your arrival. Hundreds of people held fund-raising events to raise the $50,000 I needed to pay for you. Insurance paid for the kidney, but not you. I’m not exaggerating when I say you were much-anticipated by many. You reminded me and so many others miracles do happen. Some of them have never met me in person. Who knew one small organ no larger than a deck of cards could impact so many? Of course, it wouldn’t have happened without the surgeons, the young man whose life ended the day before, and his family who allowed you to be donated to me. Because of that, my relationship with you was bittersweet right from the beginning. This is the first “re-birthday” I’ve celebrated since your retirement last year. Now it’s more bittersweet than ever. Yesterday, the anniversary of my donor’s death, I lit a white candle in his honor just as I’ve always done. The kidney I received the same day I welcomed you to my body has been replaced and one day you will be as well. Then there won’t be any part of that young man who saved my life in there anymore. But the impact of that day—the most life-altering event of my life—will live on for the rest of my life. Jim’s book, What Didn’t Kill Me Made Me Stronger: How I Found Hope While Surviving Diabetes, Vision Loss, and Organ Transplant will be published this month. That’s right, I’m a Born-Again Diabetic. Confusing? Let me explain. I was a Type I from the age of 12 until I had a pancreas transplant when I was 33. It came with a new kidney. Diabetes took a toll on me. Being diagnosed at that age, I wasn’t always a model patient. It caused me to have kidney failure, lose part of my vision and parts of my feet are numb. I loved being a “former diabetic” after the transplant. Or is the proper term “ex-diabetic”? It doesn’t matter. I felt the way a parolee from prison must feel. No more shots. No more blood tests. No more diet. No more strict sschedules. Well, I had to start taking anti-rejection meds—lots of ‘em—twice a day. Compared to the life I lived before, that was nothing. I was free, free, FREE! It lasted 14 years, which is longer than the average transplanted pancreas lasts. The doctors tell me I didn’t “wear it out.” But, losing it does feel like a failure. It’s a loss, to say the least. So, here I am, a Type I again. The simplest way to put is Born-Again Diabetic. Yeah, it sorta makes it sound like it was my choice, but I’m trying to be clever, light-hearted, and witty. You can expect to find some light-hearted wit here, along with some brutally honest complaints, joys, worries, and soul-searching. I’ll pass along articles I find about pancreas transplants, Islet cell transplants, and other diabetes-related news. 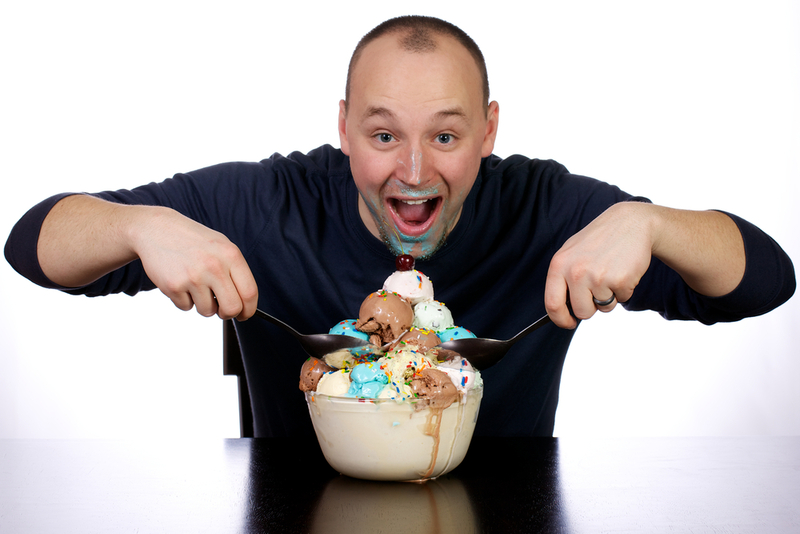 No, I won’t be the Diabetic Guru of the blogosphere. I’m not making any claims to always be the first to post the latest and greatest diabetic news. I’m happy to pass along on-topic news from you. I’ll probably post a recipe now and then, but that doesn’t mean I’ve tried them myself. Writing is my strong suit. Cooking is not. My original and transplanted pancreases may not work anymore, but my sweet tooth is alive and well. If you know some simple, easy to prepaire dessert recipes for diabetics, I’m sure I’m not the only one who would appreciate you sharing them. Above all, this will be a journey and I invite you to join me as I adjust to life with a disease I conquered once. Maybe I’ll get another pancreas. Maybe I’ll get transplanted Islet cells. Maybe I’ll get an artificial pancreas. One day I hope to be a Former Born-Again Diabetic. Or is it Ex-Born-Again Diabetic? Whatever happens, you’ll find out about it with me. And it will be an honor to share the experience with you.